There are some truly fantastic open source projects that have repeating backgrounds that are free to use around the web. Finding the right one involves a lot of downloading and FTPing to find one that works with your color scheme and site. The goal of this project is to provide a simple way to try out background images on your development site. You can preview any of the backgrounds on this site by clicking on them. The size of each background image is noted at the top of the preview thumbnail. 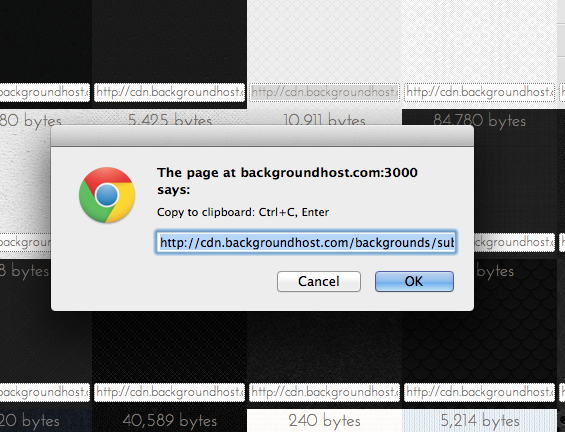 You can easily copy the CDN url of the background image by clicking on the url shown at the bottom of the thumbnail. By pressing ctrl-c (or cmd-c on mac) you can copy the URL to your clipboad.